Remove the roots and discoloured leaves from the leeks. Cut off most of the green tops, leaving about 8cm. Halve the leeks lengthways and wash well to remove the soil between the leaves. Cut out the root core, then slice the leeks fairly thinly. You want to have 600 – 700g of sliced leeks. Place the leeks in a colander and wash again to ensure all the soil has been removed. Drain well, then sprinkle with the salt, rubbing it through the leeks with your hands. Leave for 15 – 20 minutes, until the leeks are limp. Rinse the leeks to remove the salt. Press the leeks well so that excess moisture drains out. Combine the leeks in a mixing bowl with the feta, parsley, chilli and oil. Beat the eggs, set 2 teaspoons of the egg aside, and add the remainder to the leek, stir well to combine. Divide the pastry in two, with one piece slightly larger than the other. Roll out the larger piece on a floured work surface and place into a 30cm, greased, round baking dish. Spread the leek filing into the pastry and moisten the pastry edges with water. Roll out the remaining pastry and place over the top. Press the edges to seal well, then trim and crimp around the edge. Beat the reserved egg with a little milk and brush the top of the pastry. 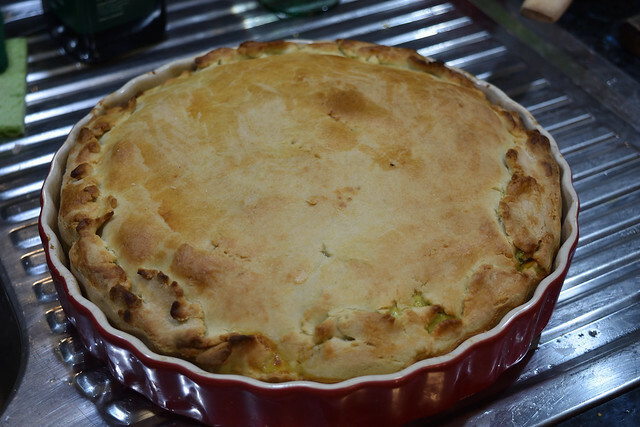 Cut small slits into the top of the pie, to allow steam to escape. Bake for 30 minutes, or until golden brown. Allow the pie to stand for 10 minutes before cutting into serving portions. Put the flour and salt into a food processor. Cut the butter into small pieces and put into the food processor. Blend until the mixture resembles fine breadcrumbs. Beat the egg yolk and add to the food processor with 85ml (1/3 cup) of ice water. Blend until the mixture forms a dough. Remove from the food processor and knead lightly until smooth. Cover and rest for 20 – 30 minutes (if you’re in a warm environment (like summer), then leave it rest in a cool place such as the fridge). If you don’t wash the leeks after salting them you will die of a salt overdose from the salt and the feta. Trust me, we struggled to eat this dish because it was WAY too salty. You can see that I’m not great at making pretty pastry, but it’s not too hard to make if you have a food processor. Really, this dish was the only failure of the night, and that’s because it wasn’t tested before being included, not because I messed up. Unless of course the dish was meant to be salt with extra salt on it, which I’m pretty sure it isn’t. In a large saucepan, boil the potatoes in their jackets until tender (approximately 20 – 30 minutes). Drain the potatoes and leave to cool slightly. Remove the skins, place in a bowl and mash. Meanwhile, soak the burghul in a bowl of cold water for 5 minutes. Drain it through a fine sieve, pressing well with the back of a spoon to squeeze out all the moisture. Add the burghul to the mashed potato, along with the flour. Season to taste with the salt and pepper and combine thoroughly to a paste. To make the filling, place the onion in a saucepan with 2 tablespoons of water. Cover and steam over a medium heat for 10 minutes, then remove the lid and allow the moisture to evaporate. Tip the onion into a bowl and add the remaining filling ingredients. Season to taste with the salt and pepper and mix thoroughly until combined. Using moistened hands, shape a scant tablespoon of the burghul mixture at a time into balls. Flatten a ball in your hand, put a generous teaspoon of filling in the centre, then close the burghul mixture over the filling, moulding it into a smooth oval shape. Repeat with the remaining burghul mixture and filling. Heat 10cm of oil in a deep saucepan over medium heat to 160C. 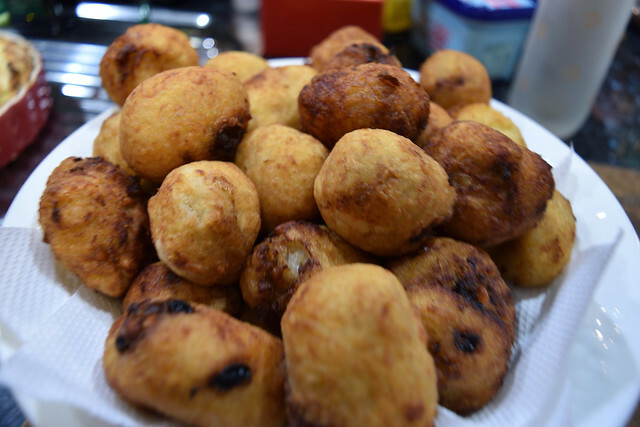 Deep-fry six balls at a time for 6 – 8 minutes for each batch, turning to brown evenly. When golden brown, remove with a slotted spoon and drain on paper towels. Serve hot or warm. These were really tasty, but they are incredibly fiddly. Expect that some of them may come apart while frying because the dough is not very dough like. Regardless, they are worth the effort, and I should make these again. Cut he chicken joints into smaller pieces if desired. Wipe them dry and sprinkle with salt. 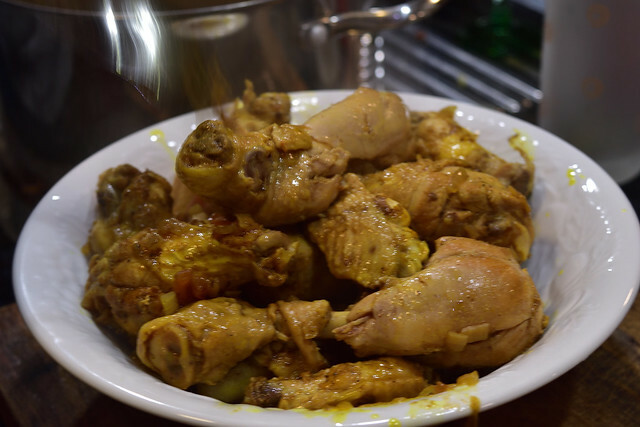 Combine the Baharat and turmeric and rub half the mixture over the chicken pieces. Leave to absorb for 15 minutes. Heat the ghee in a large, heavy-based saucepan. Working in batches if necessary, brown the chicken pieces on each side, removing each batch to a plate. Add the onion to the pan and gently fry until translucent. Add the garlic and ginger, remaining spice mixture, cinnamon, and chilli to taste. Fry for 5 minutes, stirring often. Pierce each dried lime (if using) with a skewer and add them, or the lemon rind, to the pan. Add the tomatoes, 185ml water and salt to taste, then bring to the boil. Add the chicken pieces, reduce the heat to low and cover the pan tightly. Simmer very gently for 1.5 – 2 hours, or until the chicken is tender and the sauce is thick. I don’t recall much about this recipe other than it was pretty easy to cook. We bought chicken pieces because I hate jointing chickens or asking other people to do it for me, and chicken pieces are freely available.